Note: This is not possible anymore using cameras with the 28MP sensor, like the NX1 and NX500. The front page of yahoo.com is loading and you can use the search box to navigate to whatever page you are looking for. 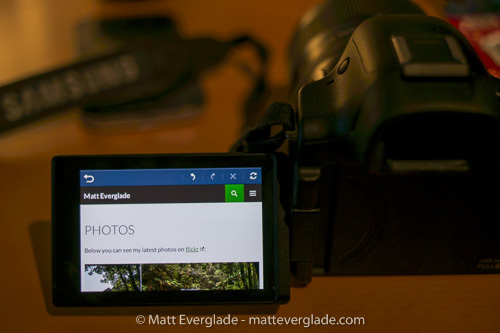 In case you have a camera without Flickr you can do a similar trick with SkyDrive instead. After opening SkyDrive on your camera select What’s this and finally you can use the loupe to search the web. Thanks to tjobbe for this hint. Legacy lenses and colour problems – Workaround!